Tuning and Maintenance Workshop at the University of Evansville. and U.E. Chaplain Tammy Gieselman. 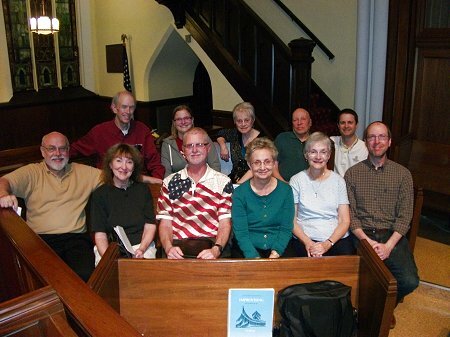 Robert Nicholls, Helen Reed, Barbara Waite and other chapter members. 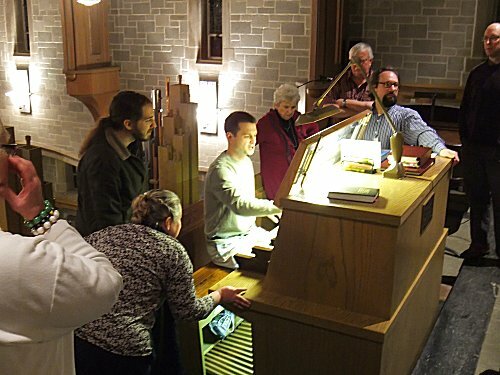 Pedals, Pipes and Pizza at First Christian Church in Owensboro. Special thanks goes to Phyllis Newman, Evalyn Champion and Neal Biggers. with Robert Nicholls as presenter. 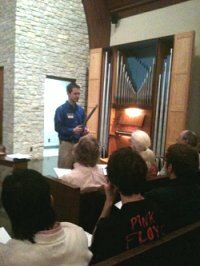 Click here to see and print out the handout Robert presented at the hymn playing workshop. It demonstrates many simple things one can do with a hymn tune to add variety to one's hymn accompaniments and improvisations. On Sunday afternoon April 22, 2012 our chapter will sponsor a recital in Honor of Dr. Douglas Reed's teaching career, at First Presbyterian Church in Evansville. Four highly successful former students of Dr. Reed's will be returning to Evansville to perform in this recital. It will begin at 4:00 p.m., followed by a very special dinner. You will soon be receiving a letter about cost for the meal and RSVP information. 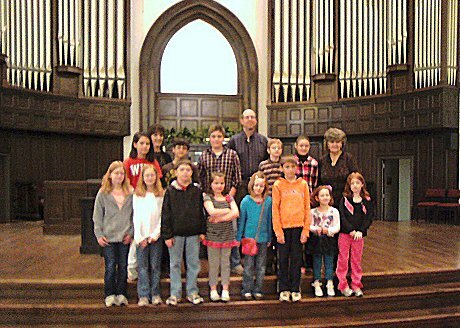 On Monday evening May 7, 2012 we will have our annual May Dinner/Chapter Meeting/Recital at St. Mary Catholilc Church. 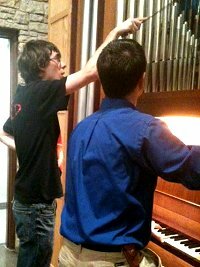 The recital, which will include a brief installation service for our officers, will feature the new pipe organ at St. Mary Church. We invite chapter members to play for this recital. Please contact Neal Biggers as soon as possible if you would be willing to play a piece or hymn on this program (nealbiggers@yahoo.com). The chapter will vote on new officers at its May meeting. According to national AGO Bylaws, additional nominations may be made by petitions signed by at least five (5) Chapter Voting Members in good standing. Such petitions must be received by the current Secretary by the middle of April. Renewals for the 2012-2013 season will begin soon. If you have questions about membership, please contact our membership coordinator, Barbara, at alcbjw@insightbb.com and we will contact you when our new membership registration forms are available. Our Executive Committee is in the process of developing Operating Procedures for our chapter. You may view a draft of the procedures here. We welcome feedback and suggestions before we vote on the procedures at our May chapter meeting.